Acupuncture is quite amazing at treating migraines, but it is certainly not magic. The practice is rooted in a clinical history of over 2500 years during which physicians and scholars wrote and discussed the best way to heal their patients. In addition, recent clinical research has shown that acupuncture provides both immediate relief for an acute migraine and also prevents future migraines. So how does acupuncture treat migraines? 1. Acupuncture balances the flow of qi, the body’s energy: By creating balance in the body, acupuncture doesn’t just treat symptoms of migraines it corrects the root of the problem. Acupuncture meridians cover the body and are pathway for the circulation of qi. Stress causes the circulation of qi to slow down or stagnate, which is why stress can be a trigger of migraines. The meridians cover specific areas of your body and can be used to relieve pain on specific areas. If you have migraines which are one sided it may be the Gallbladder channel is affected. Acupuncture points along this channel help get the qi flowing. If your migraines are on the forehead the stomach channel would be most involved. If the headache is behind your eyes, then the kidney channel is involved. Acupuncture points on those specific channels can be used to relieve the pain. 2. Acupuncture helps to regulate areas of brain for migraine pain: Studies of acupuncture for migraines show that acupuncture works to regulate pain centers of the brain associated with migraine headaches. Using an fMRI scan of the brain, researchers have shown that acupuncture actually changed the way the brain perceived pain and regulates parts of the brain that are in charge of controlling pain. So in fact acupuncture changes the way we perceive the pain. 3. Acupuncture stimulates the release of Neurotransmitters that relieve pain: Acupuncture also works immediately to relieve migraine pain. This is because acupuncture stimulates the release of neurotransmitters which relax the body and decrease pain. 4. 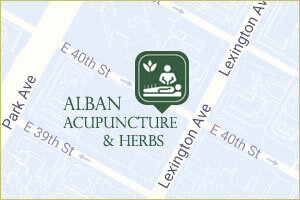 Acupuncture helps to relax the body: In migraine headaches, there is a terrible cycle of tension and pain. The muscles tense up in reaction to the pain and then the pain causes the muscles to tense up more. This cycle of pain further exasperates the decreased blood flow to and from the skull, which is one of the causes of migraines. Acupuncture cuts off this cycle of tension and pain by relaxing the muscles and relieving tension. 5. Acupuncture also relaxes the mind: Acupuncture is a very relaxing experience. Most people feel very calm during the treatment and this lasts for a period of time afterwards. Over time, treatment helps influence you to be a calmer person and increase your ability to deal with stress. This is because Chinese medicine does not separate the body and the mind. The mind influences the body, and the body influences the mind.